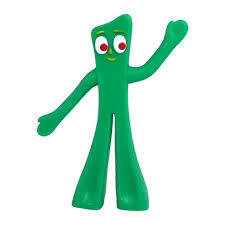 Gumby never complained but I never saw him eat, either. I’m mad at my body but I understand why it was punishing me. I had a bad time Saturday. My gut knocked me right off my feet. I can’t tell people I have a stomach ache because it isn’t my stomach, I don’t have much of one. And…because of a number of abdominal surgeries, I have an intimate understanding of where the pain/blockage/or whatever, is happening in my gut area because of a series of horrifying abdominal hernias. This was not my intestinal “Ripley“. A few years a go I had a perforated bowel (it got fixed and I survived) and this is where the pain was yesterday. I was unbelievably scared of another perforation and laid down to get things to either pass or get worse. I know it was in my large intestine also known as my bowel. (Gross, eh?) It got worse before it got better. But it did get better. My body decided to punish me for going off the diet. I pretty good yesterday (Really!) but I truly believe the pain and issue was from the day before. Friday was hellacious on the diet. Breakfast went OK with lemon yogurt, but… there was cheese scone in the student from the toast program. I heated slightly and savoured every morsel, but… there went the white food carb count. Then for lunch I had packed some turkey Alfredo without any pasta but there was pizza. PIZZA!!!! There was no limit to the temptations – all dressed with black olives and good old pepperoni with cheese. Yes, I had two slices – two more than I should have and (HELL YES!) I’m shoulding all over myself. Then there was the dilemma of what to bring home for the Friday night bring-in night. I’d already had pizza and was craving a huge juicy burger but knew that wouldn’t be good for me so…a store bought chicken, salads and a package of onion rings to cook in the oven. Macaroni and potato salad are salads in name only. Both contain big-time white foods, pasta and potatoes and the mayo and sour cream didn’t help either. 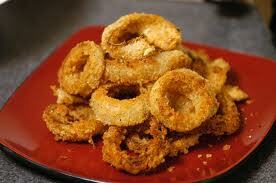 But I think it was the onion rings. They were delightful and hot and fresh (if from frozen could taste fresh, these did). I bet it was those things that took until late Saturday afternoon to teach me a lesson. I guess every once in a while we need the smack upside the head or, in my case, the blow to the abdomen. I was in such pain and was envisioning (I need to envision good encouraging things) a worse-case scenario involving a hospital and a nasal-gastric tube. But by 10 pm I was Ok enough to roll on my side and slept until after 7am. I’ll be OK. I take my body for granted. But it breathes, things, loves and is loved. It walks, it cooks, it sleeps, it laughs and it will always remember. I am my body and it is me. I need to listen to it and follow the most important messages it gives me – no words – actions. I am. 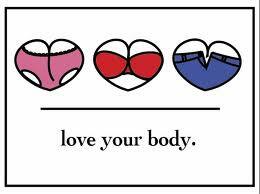 One of hardest things I ever had to do was write down a list of 25 things I like about my body. Not love – like. It was incredibly hard. I did it and will do it agin. You do it, too. I like the way my ear lobes carry earrings – they are cool! ~ by 1fatgirlshrinking - Diane Kirby on April 7, 2013.